In several areas of public, semi-public and private communication, a linguistic usage has become common: hate messages in an aggressive and insulting language as well as rude words are found in politics as well as in social networks. At the same time we witness an increasing number of distribution of hoaxes to purposely fuel our fears. 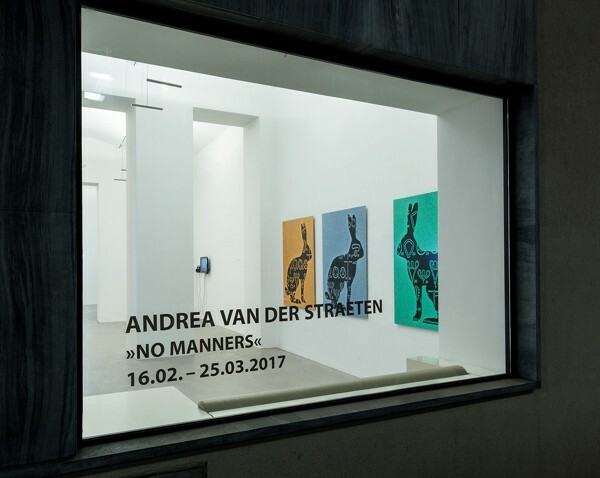 Andrea van der Straeten is working in the field of common parlance for nearly 20 years. Those forms of communication, which tend to have a rather bad reputation, correlate with current politics and gender related behaviour and are being linked in an astonishing way with literature and poetry. She chooses and implements a respective style for her works from a broad sectrum of cinematic, photgraphic, installation-based, graphic, auditive and performative techniques. In doing so she analyses the respective media as well as pro-cesses and functional contexts within the art itself. In many of her works she combines her interest in language and literature with a visual surprising vocabulary and an experimental technical approach: when she underlines the aggressive power of assaulting language in a series of laser cuts on paper by combining aesthetically striking colors and materials with the cut out of letters that remind of bullet holes, or when she uses semitransparent dry waxed pizza paper for drawings and texts to form poetic samples.